If you follow me on Instagram, you'll know I love a good selfie. If you ever get hold of my iPod and take a look at my camera roll, you'll probably do exactly what Leona and Marie did on my hen do, and instantly rip me to shreds about my vanity! I can't help it: If I'm having a good face day, I just want to show the world! Of course I have insecurities, like everybody else, but, generally speaking, I'm quite happy with my face. I like to think it's a good face to have. I love my eyes, I like the natural shape of my eyebrows (I never, ever pluck them) and I even like my round, rosy hamster cheeks. 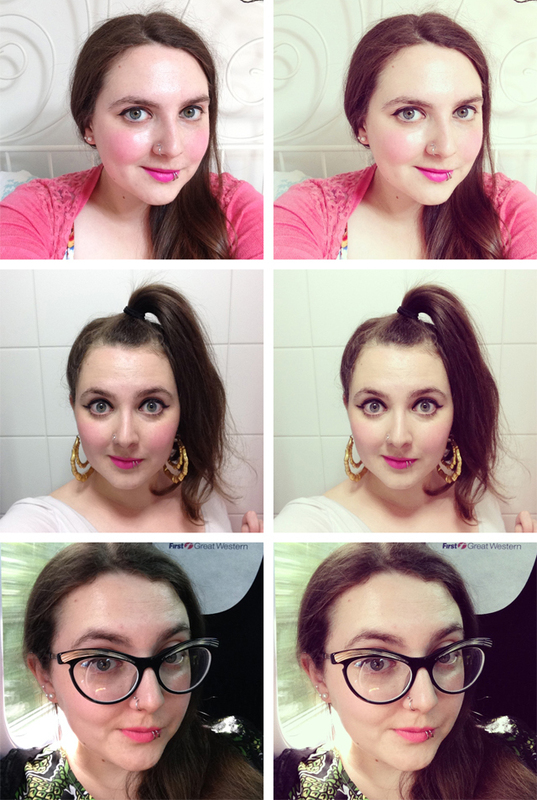 When it comes to Instagram, I'm all about Valencia, so I was really interested ReeRee's post on selfies and filters. Straight away, I knew I needed to post something similar. So prepare yourself for my face: filtered and unfiltered! I just like the effect that Valencia gives. Of course, it's nice that it smooths over imperfections and creates a more even look but, as you can see, if doesn't radically alter my face. I think I'll be sticking with my filters for now. That's nice filter. I think taking pictures of your face over and over is a great way to gain self confidence and to just get used to your face at different times and different days. I agree! I've definitely found "my side", as you can see from these! I used to hate having my photograph taken so I started doing silly face selfies to get used to it. I'm quite happy now especially since I can mess about with filters easily these days. I think selfies can be a really good way of gaining confidence since you have complete control over the image. Valencia is my favourite filter too. I use it on nearly all of my photos. I use it on all of mine haha! First of all: thank you for this post! I ADORE selfies, and (weirdly) I love seeing other poeple's selfies. I know a lot of people who complain about how annoying it is that half of their Facebook newsfeed is littered with girl's contorted into duck-faces or whatever...but isn't it better to have that than girls with low self esteem who are too scared or repulsed by themselves to show their faces? I know for me if I'm having a crappy day, taking a quick photo, using a nice filter and getting one or two positive comments always cheers me up, so why not! Sorry for the rant, but I like these sort of posts. I love seeing other people's selfies too! I agree with you. I'd much rather see confident girls than girls too afraid to show their face! Thank you so much! Nothing wrong with a selfie addict! Valencia is definitely the best. Thank you so much! I always forget about the filters on IG. Looks as though they can be quite useful though - I like Valencia. Haha I remember you saying that about 10 years ago!